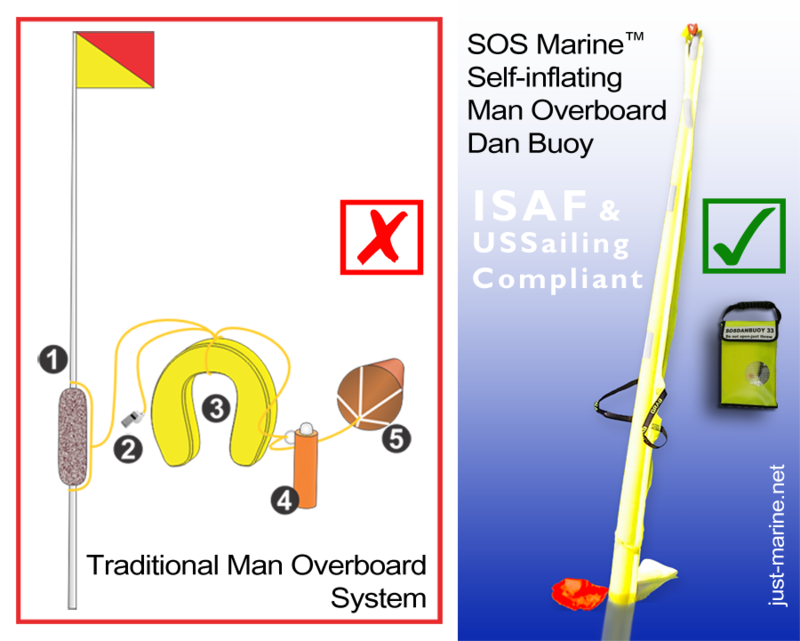 (Newport Beach, CA, May 1, 2014) Just Marine is distributing SOS Marine of Australia’s internationally renowned quick to activate, inflatable man overboard marker dan buoy throughout North America. Navies and coast guards around the world, power and cruising sailors, and yachts in the iconic and dangerous distance race, the Sydney – Hobart Yacht Race, use this dan buoy. The dan buoy has significant features that make it desirable for the offshore boater, says Just Marine President, Philip Thompson, former America’s Cup campaign skipper for Australia. No preparation is required during a man overboard emergency. When the emergency happens, immediately throw the dan buoy into the water. Upon hitting the water a 33-gram CO2 cylinder activates the instantaneous inflation of a 6′ high and 4″ thick day-glow pole with an 8′ long ribbon streamer flying from the top. 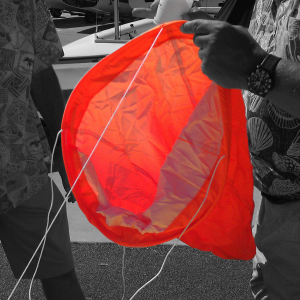 The dan buoy’s SOLAS strobe light flashes upon inflation of the pole, making it visible for a mile or more during the night. Search area greatly increases with distance from boat. Rapid deployment and good visibility is important. Just one minute at 10 knots will open up a search area of approximately 258,000 sq. feet using a narrow 30 degree search arc, says Thompson. The dan buoy’s large oversize sea anchor or drogue causes it to drift in the same general location and at a similar rate as a man overboard. It moves primarily with the current rather than the wind whereas many man overboard devices used today tend to blow away defeating their purpose. Arm straps and approximately 20+ lbs. of positive buoyancy will assist in keeping the man overboard afloat and calm while s/he hugs the dan buoy and awaits assistance. A whistle is also attached so the man overboard can draw attention during fog or low visibility situations. There were 197 man overboard fatalities in the U.S. in 2012. Many boaters do not realize how hard it is to find a man overboard, said Thompson. It is wise to practice rescues on a regular basis to keep your crew skills sharp. No sooner had Chuck Hawley seen the dan buoy demonstrated than did he incorporate it into his Safety at Sea seminar demonstration materials. The reusable dan buoy can be dropped from up to 1,000 feet in elevation making it a useful marker for search and rescue aircraft assisting water-based rescue teams. It is self–contained and easy to deploy. It could also be thrown from any cruise ship into the water near a cruise ship passenger overboard. The dan buoy satisfies ISAF World Sailing Offshore Special Regulations requirement for inflatable marker poles, meets US Sailing safety equipment requirements, and eliminates the windage and inconvenience of a tall pole and gear on a yacht’s backstay. The dan buoy’s convenient 11″ x 7″ x 3″ storage pouch can be kept in an easy to reach location in the cockpit or wheelhouse. 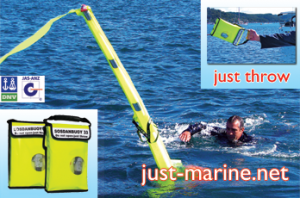 Read about the dan buoy specifications and watch operation videos at the Just Marine website, www.just-marine.net.